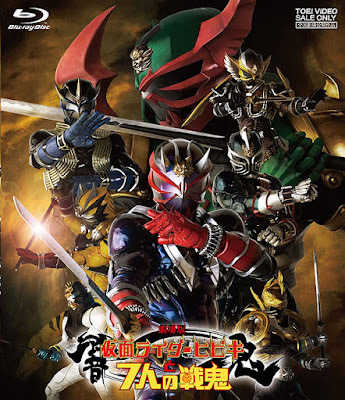 The Kamen Riders, known as Oni, battle man eating beasts called Makamou with "pure sound". One of the Oni, a man named Hibiki ends up having a teacher and apprentice-like relationship with Asumu Adachi. A young boy unsure of himself and is at a crossroads in his life as he transitions to high school, Asumu learns to be an adult through watching Hibiki and the other Oni as they all train together to hone their skills in fighting the Makamou and the homunculi aiding them. However, the sudden raise of Makamou numbers proves to be a prelude to an upcoming calamity. Hibiki and Asumu are on their way to a Makamou attack on the beach. Once they arrive there, they see dozens of people running from the massive Orochi, a beast rumored to be the strongest Makamou ever created. Once they arrive, Hibiki walks towards the Orochi and transforms, but all of his attacks prove useless against Orochi. The situation is made even more dire when Hibiki jumps in the way of an attack meant for Asumu. Taking the full force of the attack, Hibiki passes out as the Orochi swims away, leaving a panicking Asumu to get help. Hibiki ends up in the hospital and Asumu begins blaming himself for Hibiki's injuries. Feeling useless, he begins helping at Tachibana's, going through dozens of books to try and discover a way to defeat the Orochi. Upon coming across a book with his name on it, Asumu sits down and begins to read what turns out to be the history of Takeshi, the Oni and the Makamou war. In the Sengoku Jidai, also known as the Warring States Era, a young boy who has the same resemblance and name as Asumu is wandering around with a friend who resembles Hitomi, named as Hitoe. The two come across a young girl, Suzu, who resembles Akira. In this time, the humans all knew and feared the Makamou, sometimes forced to.sacrifice one of their own to spare an entire village from the Makamou. Suzu was such a case as she was offered up as the yearly sacrifice to the Orochi to keep it from killing the villagers. After some protesting from the girl's father, the man was killed by Douji and Hime before Suzu and her father's corpse were consumed by the Orochi. A year later, a mark appears upon Hitoe's hand, making her as the next sacrifice to the Orochi. Asumu, unwilling to let her meet such a fate, sets out to find a way to stop it. He meets people resembling Oyassan, Hinaka and Kasumi who tell him about the Oni, whom many villagers see to be no different than the Makamou, despite the fact that they fight the monsters. Asumu understands the danger but insists on setting out in spite his own history with a Oni. Oyassan sends along his daughters to help. The group then enters a town being attacking by a Makamou. A young man appears before the Makamou, an Oni named Kabuki who has been hired by the town's people to defeat the Makamou. But once he defeats the monster, Kabuki finds out that the people can only pay him with food. Kabuki then offers his food to a younger boy, but the boy's mother quickly slaps the food away from the boy due to the taboo of humans' contact with the Oni. Afterward, Asumu's group comes to find a small home where a former Oni named Hibiki lives. Asumu instantly declares his hatred for this man as he believes him to be the one that killed his brother. Asumu's older brother, Takeshi, was the apprentice to Hibiki and was killed one day in a rock slide. Asumu found Hibiki carrying his brother's body and assumed that Hibiki was his brother's killer. Without Hibiki, the group moves on to find the next Oni; Ibuki. They find Ibuki, or Prince Ibuki as he is known in this time, inside a castle filled with women, guards and advisers. Bored with his life as a feudal lord, Ibuki quickly takes care of his court and leaves with the group. The group then heads on to a small temple, where they find a meditating man who resembles Zanki. Ibuki says that he is a great and wise buddhist priest named Touki, but Kabuki doesn't believe this and throws a rock at Touki without him knowing to test him. Touki stops the rock in mid air and returns it right back at Kabuki's head, joining the group without much of a fight. The Oni then try to trick the Makamou by setting Ibuki up as the sacrifice in Hitomi's place. After finding out it was all a trick, the Makamou then attack Ibuki, who is quickly aided by Kabuki and Touki. Touki makes quick work of the attacks with his freezing power. Orochi then shows up and forces the Oni to leave the battle and receive a cold welcome from the villagers for making the situation worse for them. Realizing their strength is not great enough yet, the group sets out to gain more partners. They meet Kirameki, a fish-themed Oni who seems rather useless at first but joins anyway. Next the group make a stop in a village where Asumu is attacked by a group of Samurai. Hibiki, who has been following the group, quickly jumps in and saves him without Asumu seeing anything thanks to his head being under a bucket. The group then learn of Nishiki, the tiger-themed Oni who is to be put to death for a number of crimes. The group comes to witness his public beheading, but Nishiki surprises everyone by catching the sword to be used in his beheading with his teeth. He then escapes and joins the group, who are being watched by a young girl that turns out to be a Makamou that specializes in killing Oni. Habataki is the next Oni to join the group. He used to fight in wars but no longer wishes to see violence now that he has a wife and son. Habataki agrees to joins the group only after his wife persuades him to take up the cause again as long as he lives to come back to her. While they are traveling, they find Todoroki being attacked by Bakegani. Nishiki, Habataki and Kirameki transform and join in to help him. Todoroki joins them as his thanks since he was sent by Hibiki. Back at Asumu's village, Hitoe has fallen ill and has gone to a cave to hide. However, the Douji and Hime threaten the villagers with a plague if the girl is not brought to Orochi at once. A group of villagers then go out to retrieve Hitoe after the Oni returned. The villagers are found murdered later, with Nishiki's weapon at the scene. The house where the Oni are staying is then burnt down, and the Oni are told by the villagers that Nishiki's weapon was found at the sight of the murders. The group of Oni then get into a fight over the situation, but the fight is broken up once Hibiki comes along. It is then revealed to Asumu that Hibiki did not kill his brother, and that his brother was crafting a special sword for him. Hitoe is then brought home but is afraid of Kabuki. The night of the murder, she saw Kabuki killing the villagers and left Nishiki's weapon there to frame him. The Makamou from Kabuki's first fight then appears to help Kabuki fight Hibiki, the two get away without Hitoe. The group of Oni then break up and head their own ways, but before doing so, Todoroki returns Hibiki's tuning fork and Disc Animals to him. Kabuki then ambushes Hibiki at his home, where Asumu appears and hands Hibiki the sword that Takeshi had made. He asks Hibiki to fight for the memory of his brother, and then for the first time in years, Hibiki transforms and fends off Kabuki and his Makamou partner. After a long battle (with them pitting gigantic Disc Animals at each other and then fighting close-range), Hibiki is able to defeat the two, with Kabuki soon killed off by the Oni-Hunter Makamou. Back at the beach, Hibiki begins fighting with a massive group of Ninja Makamou. Asumu then shows up with the other Oni who are there to help Hibiki. The battle goes on until Hibiki comes head to head with the Orochi. At the climax of the battle, the Armed Saber is swiped away from Hibiki's hands and into the sea. In the present, Asumu sees that the last page to the book is missing and not showing how that battle ended. Asumu then finds out that Hibiki is well and fighting the Orochi again. Apparently knowing where the Armed Saber is, Asumu heads off to a cave and finds it in there. He gives Hibiki the blade in the middle the battle with the Orochi. Hibiki is able to become Armed Hibiki and defeats the Orochi. In the past, the group is seen talking in the aftermath of the Oni's fight with the Makamou army. They mention that a human and Oni partnership would be best for both sides in the future. The other villagers agree and then decide that the group shall be called "Takeshi", honoring the memory of Asumu's brother.